Day Hunt On the Final Oblivion by Meyari McFarland (UK link, US link) is set on a space station inhabited by millions of aliens of a vast array of species. 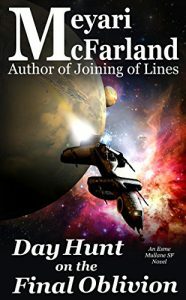 A new commander arrives to take over the human habitat on the station, and the former commander takes him off to explain how things work around here. Except… they disappear. Esme Mullane ends up in charge of the investigation and the more she looks, the more suspicious everything becomes. As she digs deeper, it seems that she is facing an enemy she thought she’d left behind her. This story is part of a series and there are references to events that have taken place in a previous book, but the important concepts are introduced as required so it’s possible to read this book without having any background knowledge of the earlier book. I think a few aspects of the book might have been clearer to me if I’d read the earlier book first, but I was able to follow this one without getting lost. I really like Esme as a character. She’s tough, she’s dependable, she cares about saving the people around her without necessarily being nice to any of them. She has a tendency to give everyone nicknames, which actually worked really well because the story threw a bunch of characters at me and it was easier to keep straight the characters with nicknames like Bright Boy and Shiny than if I’d been bombarded with a load of names. Esme is slightly bitter and cynical, but manages to maintain a sense of humour and she will do what it takes to get the job done and that makes her a really easy character to root for. The plot itself moves quickly. It’s action adventure with a touch of mystery thrown in. I think the mystery aspect might have had more impact on me if I’d read the earlier book because I was busy trying to figure out the way this world works as well as following the mystery. One thing I struggled with was the names of the various races. A lot of the aliens had thoroughly unpronounceable names. Esme’s tendency towards nicknames did crop up a little bit, and one of these races was nicknamed the Fur Babies, which makes it easier to create a mental picture of them as well as giving a name I can pronounce. I would have liked it is some more of the major players in the story had nicknames for their species as well. From the diversity angle, Esme is bisexual and there are a few other sexual identities represented, including a minor character who is in a poly marriage. Overall, I’d give it four stars, but it’s possible I might feel more generous with stars if I came at it having read the first book in the series. It needed a better proof-reader though. There were quite a lot of typos and some threw me out of the story while I tried to figure out what was meant and that nearly dragged by assessment down to three stars. 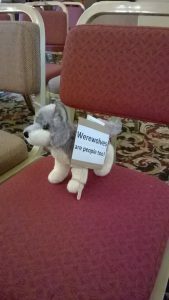 Sunday 1st April was the official launch of my new novel, Wolf Unleashed. This launch was accompanied by a small launch party at Eastercon. The room for the launch party seemed a little strange to me – we were set up at one end of the large ballroom, which was also the room being used for convention food. We were there in the middle of the afternoon, so we were between the lunch and dinner rushes, but there were plenty of people in the room just there to eat food, and hang out with friends. I’m fairly sure there were some people who came to the book launch who hadn’t intended to do so, but who had been sitting near our end of the hall and were curious what was going on (or were curious about the free wine). David, my editor at Guardbridge Books, spoke for a little bit, introducing me and the other two books which were being launched at the same time. 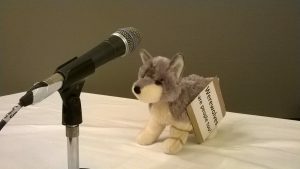 Then I spoke briefly and read from Wolf Unleashed. David read segments from the other two books, and then we opened it up to questions. We did a giveaway drawing to give away a free book. The winner of the giveaway chose to get Harry Elliott’s Warrior Errant as his free book instead of mine, and he gave a little apology about that, but then a few minutes later decided he would buy mine as well, so I think I won that. Overall, the launch was short, informal, and enjoyable, so I’m happy with how it all went. There have been some other great moments this convention. One was when a woman sat beside me in the audience for a panel and started rummaging around in her handbag. Then she noticed my name tag and went, “You wrote the Codename Omega books,” and started talking about the handbag scene in Traitor in the Tower. For those that haven’t read those books, the scene in question is one of my favourite moments and involves Jenny, having been captured, pulling an array of useful items out of her handbag – from painkillers to means of communication to weapons – much to the astonishment of the guy who was in the cell with her. There’s still something that fills me with delight about someone recognising me and telling me about things they loved from my books. 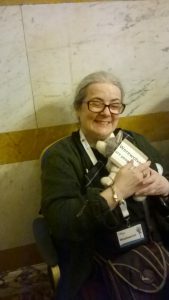 Another great highlight was meeting a lovely lady who was much enamoured of my cuddly Thomas toy wolf (so much so that I feared wolfnapping was a possibility) and who talked at length about her love of wolves and her experiences visiting a wolf sanctuary. We had a really long chat on Friday and then when I bumped into her again on Saturday she had been hoping to see me again because she’d bought me a wolf bracelet. I was so immensely touched by this and wished I had something I could give her in return (but I wasn’t parting with cuddly Thomas). I took part in a couple of items aside from the launch party. The first was a panel on transgressive sexuality where we had some good discussions about representation of different sexualities in SF&F and how the barrier between what is seen as transgressive and what isn’t is a shifting line that changes over time. We discussed a whole collection of books, films, and TV shows and I got to recommend some of my favourites (like The Long Way to a Small Angry Planet) and took down some suggestions of things to read. My other piece on the program was a talk on Atheism and the Representation of Religion in Science Fiction. I got a little worried about this talk ahead of time because I was originally told I would have a 75 minute slot, and then saw on the agenda that I had an hour. I then found out when I got there and looked at the schedule in more detail that each hour slot included a ten minute break/change-over and so I only had 50 minutes. I shuffled some things around and cut a couple of slides, only I guess I talk faster in real delivery than I do in practice because I ended up having plenty of time. I could have left the Vorlons in. I have uploaded my presentation to OneDrive in case anyone wants to view my slides or see the links in the references. I was also a little concerned about that presentation because of the timing. 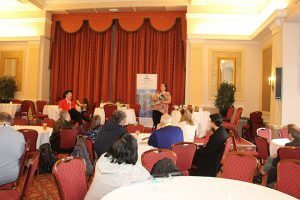 It was right at the end of the last day of the convention, in the slot before the closing ceremony, and I knew a number of people who’d told me they would be leaving before my talk began. I was a little worried I would be giving my talk to an empty room, but I got a decent turn out in the end. 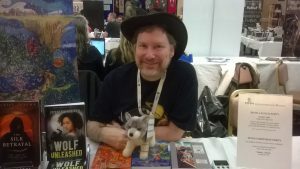 Afterwards, the girl who’d been running tech for me came up to me and said we’d met at World Con a few years ago and I’d persuaded her to buy one of my books then. She was very excited to read my new one now, which was amazing to here. It is an amazing feeling to meet people who’ve read my books and have them talk so enthusiastically about them. All in all, a really satisfying Eastercon. I look forward to next year’s, which will be considerably easier for me to get to.